~ FLATFORM ~. AUTHENTIC TEVA. THONG STYLE. MY PRODUCT. COLOR: NIGHTSHADE FLORAL. SATIN UPPERS, SYNTHETIC FOOTBED,RUBBER SOLE. 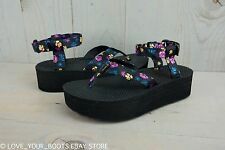 ~ FLATFORM THONG FLORAL ~. AUTHENTIC TEVA. THONG STYLE. MY PRODUCT. 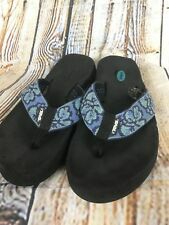 Pre-owned Teva Sandals in fair condition. There are a few snags on the fabric. The soles are in good condition. A couple minor discolorations. There is a small crack at the toe and a piece of rock stuck near it. 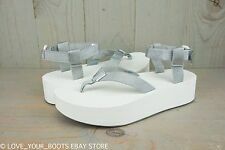 Teva 4242 Womens 8 Madalyn Strappy Thongs Flip Flop Wedge Sandals FLORAL NICE!! (One issue see photos (scuff) otherwise perfect. I have more! I have them in many prints:). I Have more! THESE SANDALS ARE S/N 1536. AMAZING FLORAL BLUE ADJUSTABLE WATER SANDALS. PERFECT SANDALS LOVE THE DESIGN. with LIGHTER BLUE with THE DESIGN OF FLORAL- FLOWERS. MAIN COLOR DARK BLACK TO BLUE. Style# 6433. Color: Black with heavy dark blue weaving and gray flowers with yellow centers. (Size 7 EU 38. I have them in many prints:). I Have more! SHOE TREES/INSERTS ARE NOT INCLUDED IN THIS SALE .